I've stared playing around with piclking veggies as I keep hearing how good it is for your health. I grew up eating 'cornichons' so I've always loved the taste of pickled veggies. I thought that it was hard to make but that is so not the case. I experimented with pickling eggs this time just to have fun around Easter and it turned out so good that I thought I would share it!!! Combine the water, vinegar, honey, peppercorns, bayleaf, garlic in a small saucepan and heat up just until the honey is dissolved. Place the beets in the mason jar and pour the liquid until beets are covered. Add the boiled eggs, close the lid and store in a dark place for 2-3 days at room temperature. 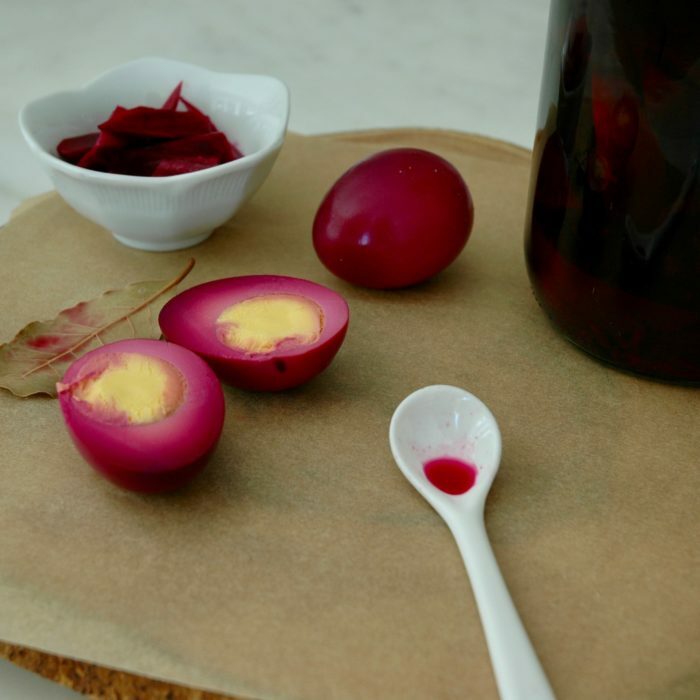 Taste the beets to see if they are pickled enough for you and if so transfer to the fridge. You can enjoy the eggs right away or leave them in the liquid for a few more days.